This Single Story Home With 3 Car Garage, 4 Bedrooms And 3 Baths, An Office/Playroom and Spacious Formal Dining Room Is An Entertainers Dream! This Home Features A Gorgeous Pool And Jacuzzi With Spacious Lanai And Outdoor Shower, Great For Enjoying The Beautiful Florida Weather With Family And Friends!! Ideal Location Across From Enders Playground/Fitness Center And Pool! Relax And Visit With Friends On Your Shaded Front Porch While Enjoying The Park And Tranquil View! Tons of Upgrades! Kitchen And Flooring Were Recently Updated! Beautiful Kitchen With Light Cabinets, Stainless Steel Appliances, Granite Counters And An Island! Adjacent to the Kitchen Is Your Own Wine Room With Exquisite Wrought Iron Designs! The Family Room Is Open To The Kitchen And Features Beautiful Built In Shelves and Tiled Fireplace! Master Bedroom Area Features A Gorgeous Ensuite With Dual Sinks And Garden Tub With Spacious Shower! 2 Large Closets And Private Entrance to Spacious Back Patio Make This Master Bedroom A True Retreat! The Many Upgrades Including High Ceilings and Plantation Shutters Give This Home A Luxurious Feel But At The Same Time Spacious Bedrooms And Lots Of Natural Light Give It A Warm And Welcoming Feel! This Home Is Just Waiting For You To Make Memories! Baldwin Park Is A Highly Sought After Neighborhood With Its Walkability, Premier Restaurants And Shops, Baldwin Park Lake With Walking/Running Path Around It, Various Play Areas And Three Community Pools! 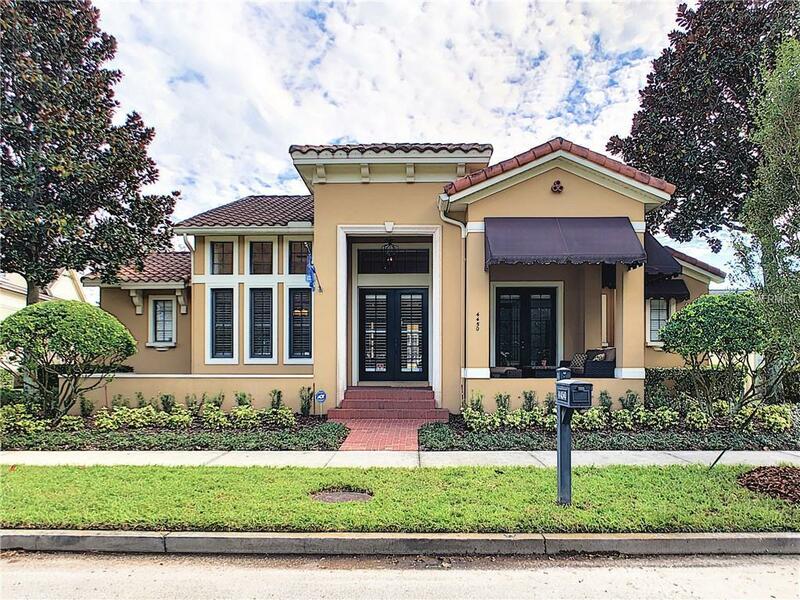 Minutes To Downtown Orlando And Winter Park!